History: Hi my name is Blas T. Díaz. I was born in CD. Valles, San Luis Potosi. I lived in San Vicente Tancuayalab until I was 10 years old, then I moved to Houston, TX. In 2018, my Dad gave me land and I decided to start my own egg farm in San Vicente Tancuayalab. I name the farm HuastecaMX for the region of the Huasteca. I looked around the cryptocurrency world and I saw the opportunity to create a token that could keep its value, one that could be back by a physical chicken. This is how HuastecaMX was born. HuastecaMX is a project like no other. Each HuastecaMX token represents a physical chicken from my farm. 9/27/18 to 12/27/18 We started our Privet Pre Sale for the Waves Community Forum. We sold 16K HuastecaMX in the private pre-sale. 2/1/19 with the previous private sale, we were able to buy new chicks and have a solid foundation for our project. 14K HuastecaMX were purchased back. 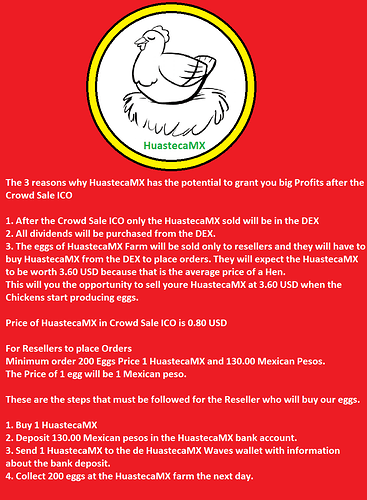 2/16/19 to 11/16/19 We will have our Crowd Sale ICO so we can start buying our new chicks and to have all our HuastecaMX Token backed by a physical chicken. 11/17/19 Once the sale of the crowd is finished, each HuastecaMX will represent a physical chicken, and it should be valuable as such. 11/28/19 In our ecosystem, we will use HuastecaMX to receive egg orders through the Waves Platform, requesting a quantity of HuastecaMX to be send to our Wave Address to place the orders. HuastecaMX is a project like no other. 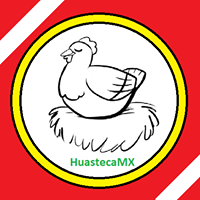 Each HuastecaMX token represents a physical chicken from my farm in San Vicente Tancuyalab. This is the key part of my project and will help you understand the value of the project. Each chick will be purchased at approximately 0.35 USD. 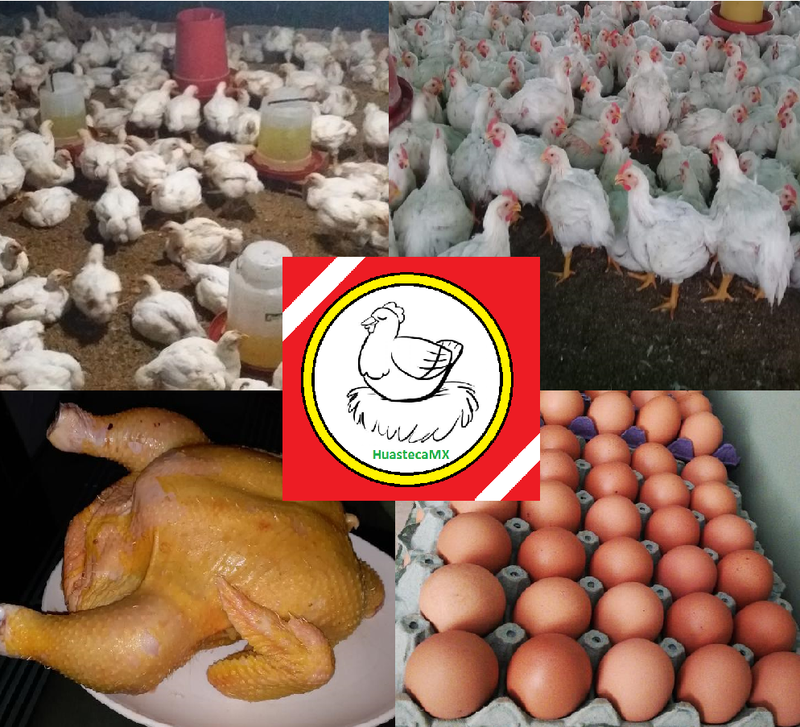 We have the vision of having 200,500 Chickens producing eggs. Having 200,500 chickens to back our HuastecaMX token. We will like to grow and double our farm ASAP. As the numbers grow the value of our Chicken will represent 2 chickens the 3 then 4, hopefully in a short about of time. Approximately 7 months are required for the chicken to start producing eggs. It will produce an average of 1 egg per day for approximately 4 years. The price of the chicken will be determined by a website of the Mexican governor that will give the price of an average chicken in San Luis Potosí. That is the price that each HuastecaMX will represent. The website gives a daily average price of a chicken sold as food. In Mexico, eggs are sold by the Kilo. That’s about 19 eggs per Kilo. In the pasta years, the egg price has risen to 4.00 USD per kilo and in some areas of San Luis Potosí, even higher. Keep in mind that in Houston Texas average egg price is 2.30 for 12 eggs, that’s about 3.45USD for 19 eggs about 1 Kilo. The local production of eggs has decreased in San Luis Potosí, which opens the opportunity for the egg farms to obtain higher profits. 100% profit: our project has the potential to have a 100% profit, we like to reuse it a lot, and this gives us the opportunity to get more benefits. Chicken poop is one of the best fertilizers and we can turn it into compost in a natural way. We will sell the compost and buy food for the chicken. This will help us have the chicken food cover. The use of solar panels is another way in which we can obtain more profits. At the top of our farm, we are planning to install solar panels. In Mexico, extra solar electricity that is produced can be sold back to the electric company. The workforce is another good reason to invest in the HuastecaMX farm. We are a workforce of 4, and it will take around 20 to 25 to take care of the farm of 200,500 chickens. The daily payment of each member is approximately USD 8 per day. The eggs will be distributed from our farm, so it is not necessary to buy any vehicles. The President of Mexico, ALMO, is determined to increase the production of agriculture in Mexico. That is the main reason to invest in Mexico and in the HuastecaMX farm. The Mexican president ALMO has a plan to create a store that will sell local agricultural products. This will help us a lot in having a secure market. The cost of labour is low around 8 USD per day. 3. HuastecaMX On Waves Platform. HuastecaMX is a token that is found in the Waves DEX. https://wavesplatform.com/ here you can buy and sell, with the Waves application you can trade in person. For the ICO Crowd Sale we are trading HuastecaMX for Waves, Eth, and BTC. Dividends paid 4 times a year, and all dividends will be purchase from Waves DEX. Estáinteresante, pero…Dispersas dividendos? O sólo es recomprar? te Puedo dar Airdrop si vas a la parte de projectos y buscas Airdrop alli pon tu direccion si ya lo hisite lo puedo hacer de nuevo. Thank you and Good luck to your project. Hi guys thank you for youre Support, Join us at the Crowd Sale ICO last change to have great returns on profit.